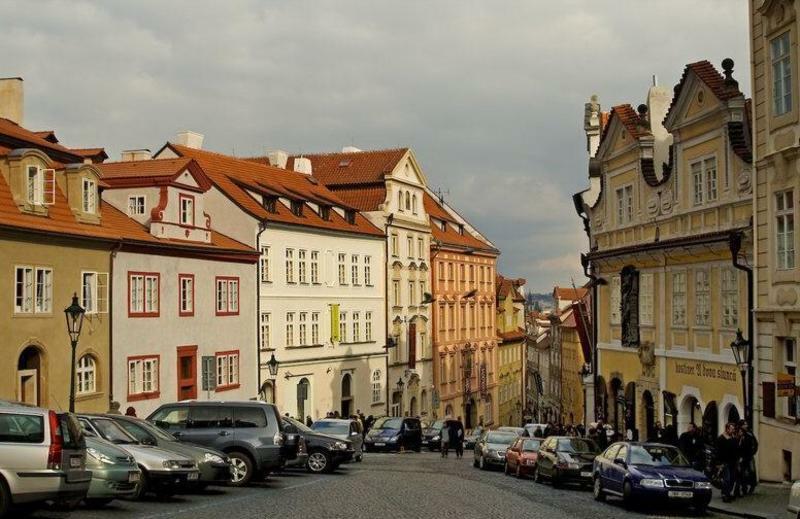 Arpacay Backpackers Hostel is situated in one of the most picturesque streets of the city that leads up to Prague Castle (120 m), and is part of the so-called Royal Road. It is within walking distance of all the major attractions, such as the Old Town Square and the well-known Charles Bridge (just a 10 minutes walk). Sleep in a unique historical building from the 16th century and enjoy an amazing view over the Lesser Town from your bedroom window! Start your day with our buffet-style breakfast or make your own home-cooked meal in our fully equipped self-catering kitchen during the day. Chill out in our cozy stylish lounge, have a cold beer on the courtyard balcony or just relax from the tourist crowds on our comfy couches in a common room where you will meet a lot of travellers at any time during the day or night. One of Prague's best STEAK RESTAURANTS, Cowboys, is located in the same building as our hostel. You can enjoy some great food in their cellar restaurant or on their fantastic ROOFTOP GARDEN with a panoramic view over the whole of Prague. At the hostel you can find also a large LCD TV with international channels and a DVD player with a wide range of DVDs. You will be able to make your next travel plans thanks to our Wi-Fi and 3 computers with FREE INTERNET. Our reception desk is open 24 hours a day and we store your luggage for free any time you need. 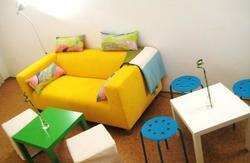 The hostel offers a variety of rooms from a deluxe private twin/triple room to large dormitories. All dorms are equipped with personal lockers and wooden beds with comfy mattresses, big pillows and reading lamps. 2 Small 4bed attic dorms offer the best view towards the Old Town and Prague Castle but be ready to climb 4 flights of stairs! 2 Female only dorms with wooden ceilings are specially designed for women-travellers. The dorms share 2 toilets and 2 showers equipped with a hair dryer. The bright and spacious 12bed dorm has a stunning view, an ORIGINALLY PAINTED WOODEN CEILING, and is probably our nicest room in general. The large 16bed dorms with private bathroom are a great deal for TRAVELLERS ON A BUDGET. At 42-56 square meters, they are large enough to be comfortable and the beds are situated in 2-3 distinct rooms that offer sufficient levels of privacy. In the lesser town you can also find the Kafka Museum, the John Lennon Wall, the baroque St. Nicolas Church and Church of Our Lady Victorious. You are just few steps from Petrin Hill, a wonderfully peaceful park with a 60 meters high Observation Tower offering a magnificent panorama of Prague. 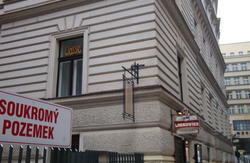 You will be surrounded by plenty of Czech pubs, jazz clubs and Cowboys steak restaurant is right underneath our hostel. The hostel is only a 15 minutes walk from the famous music club KARLOVY LAZNE. Mini-market is conveniently situated across the street and is open daily 6 am - 23 p.m.
FROM THE AIRPORT PRAHA - RUZYNE: From the airport take bus No.119 and go to the final stop Dejvicka. Take the metro (green line) and go to the station Malostranska. Get out of the subway and take tram No. 12, 20 or 22 and continue to the next stop Malostranske namesti (make sure you get on the tram going in the correct direction!). Get off here and walk up the hill to the right along Nerudova street (the street next to the car park). Go about 300 metres and you will find our hostel on the right side in the pink painted building - you will also see Cowboys steak restaurant in the same building. Go in and take the staircase on your right. The hostel reception is situated on the 1st floor. A ticket for all public transport costs 32 CZK (valid for 90 minutes once stamped) or you can get there by taxi for about 700 CZK (be sure to take an authorised taxi from the airport - the yellow taxis are normally fine).